Brussels has been the place I’ve given most attention to in the past year because I so desperately wanted to study there for my Master’s. However, after my previous visit, we’ve all seen my great disappointment in the school I found there. I would have looked into other schools but it seems that French is such a fundamental element to their education that I would fall short of understanding. Regardless, Brussels continues to be a place that I like better and better. I went out there last week to visit Chloé for three reasons. One was to just pass the time since I’ve finished working. The other was to see Chloé (and Olivia of course). But third, it was also Chloé’s birthday. I arrived Thursday morning bright and early. I had the entire city to myself. Not even Chloé was there at the moment, she was in Amsterdam visiting family. She left me the keys to her flat at the newspaper stand across the street from her place. She wrote me out a script to tell the man in French. I entered, said, “Bonjour” the best that I could, and I tried to read the note Chloé left me with the most authentic French accent I could muster. The guy looked at me strangely at first, but then understood what I meant. He laughed and handed me the keys and then in a broken English accent said, “There you are.” I smiled, grabbed the keys, and left, proud that I was already speaking French. The rest of the day was spent alone, wandering Brussels getting to discover it for myself. I had always been accompanied by Chloé but this time I got to make my own agenda. 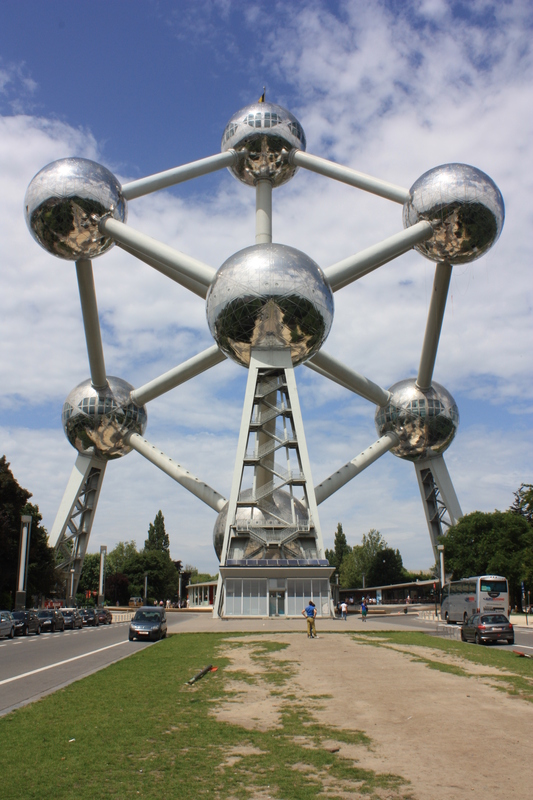 After eating lunch, I went to the Atomium. I’m not entirely sure what it is but it’s this giant sculpture in the form of an atom. Chloé told me it was boring and not worth the visit which is why she had never taken me, but I know that it’s an icon of Brussels so I wanted to see it for myself. Afterwards, I returned to the city center and went to the Modern Art Museum and saw a special photography exhibit by Stanley Kubrick. It was absolutely wonderful. He has always been one of my favorite directors but I didn’t know he was such a talented photographer. Eventually I made it back to Chloé’s house, pretty tired from having walked so much and having slept only a few hours the night before. I ended up falling asleep on her couch only to be woken by her and Olivia a few hours later. The rest of my trip was spent meeting all of Chloé’s friends around town. Our first night we went to a small get-together to drink, talk, and watch Italy beat Germany in the EuroCup. The people at the party were all wonderful, inviting, and seemed to have really gotten a kick out of having an American there. Most of us were pretty divided by language since my French is so elementary as well as their English. But I ended up getting the attention of all these Belgian guys as we discussed anything from music to politics. I’d see a few of them, including the girl that had the party again at Chloé’s birthday. The next day we were pretty groggy and I was still overtired from not sleeping the night before, so we took it easy. At night, we went out with some more of Chloé’s friends, had a few delicious Belgian beers and then called it a night. My favorite part was the bike ride home. We rented bikes to get from point A to point B. I dearly miss cruising through cities on bike, especially at night. When I move to Barcelona in August, I am definitely getting one. On Saturday, we woke up and had a picnic in this gorgeous park. We sat there for several hours just talking, eating and reading. To all of our surprise despite the cloudy day, we all ended up getting pretty sun burnt. Go figure getting burnt in a place famous for having considerably dreadful weather year round. Eventually we made our way back to Chloé’s flat to prepare for her birthday party. We made food and got cocktails already. Chloé had devised a fun game for her birthday: everyone had to wear a name tag with the name of the first street they lived on. Then, everyone was given a Hawaiian lei and if you called the person by their real name, you had to give it up. Some people ended up with several lei’s and others with none. Chloé’s birthday was a blast. There were so many people there and everyone was kind enough to make an effort to speak English so that I could understand. When they did speak in French, I tried so hard to understand but it only resulted in me getting a really bad headache. Once the moment came for us to all go out, we went to a wild karaoke bar until about six in the morning when we went home for me to grab my bag and then head directly to the airport since I had a morning flight. Brussels, as boring as Chloé says it is, continues to amaze me. It’s always a riot for me. I love the quaintness of the city, but also it’s grandiose internationalness. I felt like a complete loser there, only being capable of speaking two languages. There you meet people who speak several languages, have family all over the world and are just so downright international. I guess I hold my own as being a cien por cien American, but everyone there is just so well educated and interesting. I really hope to move there after my master’s to attempt to make myself more international. Even just talking to the people, I feel like I’m learning so much. In the few days I was there, I feel like I learned more French, more about other countries, more about my own country and just about things in general than I have in college. Not only was it a trip for pleasure, but for knowledge. And those are always the best kinds of trips. Missing Chloé and Olivia as always. Hope to see them soon.